Kenyan publishing is in a perpetual fight for survival, but sees potential in the digital revolution to open new means of distribution and production. The school children and their teachers, who had travelled to the venue from all over Kenya, had gathered in the Seminar Room for the unveiling of the 2015 eKitabu National Digital Essay Contest winners. Founded in 2012 by American Will Clurman, eKitabu distributes e-books in Kenya on behalf of publishers. One of the sponsors of the Digital Essay Contest this year was SwahiliHub, an online division of Nation Media Group that promotes all aspects of the Swahili language. A representative from the portal said that Swahili now has an estimated 150 million speakers worldwide. 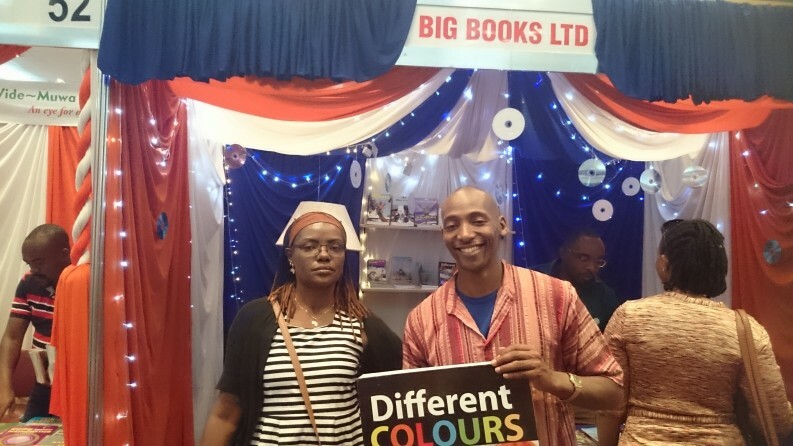 The Nairobi International Book Fair (NIBF) is an annual event organized by the Kenya Publishers Association (KPA). Officials are drawn from the top-tier of Kenyan publishers. The theme for this year is “Twende Digital” (Let’s Go Digital) and is aligned with Vision 2030 — the government’s ambitious blueprint for transforming Kenya into a middle-income country. During the opening ceremony, Mary Maina, the Chair of the NIBF, said that the festival’s events would include book launches, digital marketing and sales training, discounted sales, children’s activities, seminars, sales of book rights and a digital essay contest. In addition, she said that the event had a record attendance by foreign exhibitors, led by India which had nine. Others represented nations were China, the UK, the USA, Nigeria, Ethiopia, Tanzania, Uganda and Senegal. 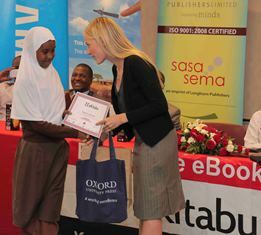 A winner of the eKitabu Essay contest receives her prize. The highlights of the 18th NIBF included two separate book awards: The lucrative Burt Award for Children’s Literature and the Text Book Centre Jomo Kenyatta Prize which is managed by KPA itself. The Kenyatta Prize honors both English and Swahili Books in three categories: Adult, Youth and Children. According to Mrs. Mary Maina, the NIBF Chair, the purpose of this award is to “To encourage and promote authors of the best literature in Kenya and promote high standards.” And indeed ‘high standards’ are something the affable David Waweru — a publisher and motivational author – would be eager to see in the Kenyan publishing space. Whether he is punching above his weight remains to be seen. 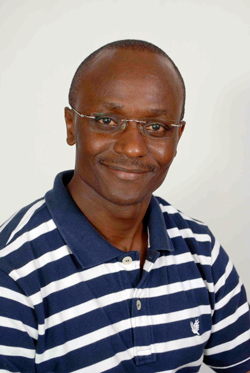 Alexander Nderitu is Kenyan ebook pioneer and the Deputy-Secretary General of PEN Kenya Centre.